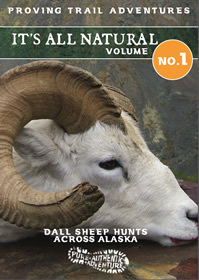 The first ever Do-It-Yourself Dall Sheep Hunting Instructional video. 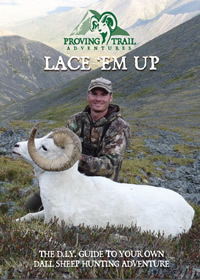 Everything you need to know in order to Lace ‟em Up for your own Dall Sheep Hunt in Alaska. 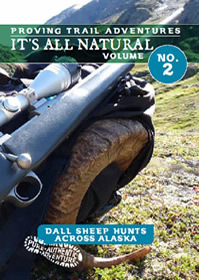 It’s All Natural – Volume 1 is the first in a new series of videos highlighting sheep hunting Alaska, the way Scott and Steve do it best; boots, backpacks and a love for adventure. Nothing is staged, scripted or rehearsed. The series continues with more full-length Dall sheep hunts across Alaska with Scott and Steve. More long miles, full curls and celebratory campfires. It's pure, authentic, adventure. 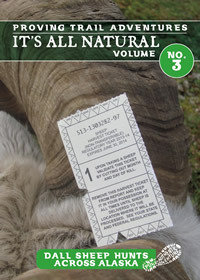 The latest installment of the "It's All Natural" series, featuring the hunts that complete Scott and Steve's epic Alaska walk-in sheep slam quest. Filmed entirely in HD and continuing the Proving Trail tradition of pure, authentic ram hunting adventure. Proving Trail Adventures is the belief that there is more to the hunt than just the pursuit of big game. There's the pursuit of God and what's inside of us. Out in the wilderness we will come face to face with each and when we return, we'll return changed. 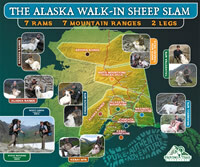 Part of the Proving Trail has been our goal to take a ram from each of the seven major mountain ranges in Alaska that have dall sheep - all by walking in from the road. As far as we know, it's never been done before. We just changed that. Seven Mountain Ranges, Seven Rams, Two Legs. Accomplished 2012 and 2014. 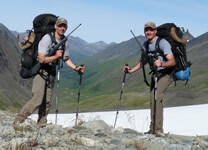 Proving Trail Adventures Videos are real life hunting videos of our pursuit of Alaskan big game. No scripts, rehearsals, staging or re-creating moments. It's 100% real backpack style hunting. We're by no means professionals, but we have some good stories to share about our hunting adventures in Alaska and we think you'll agree.